Air Troop, 40 Command Royal Marines, RNAS Sembawang, Singapore 1968. The Bell model 47 Sioux first flew in the late 1940s and saw service in both Korea and Vietnam, subsequently becoming well known to the public for its role in casualty evacuations, as seen in the MASH TV series.. 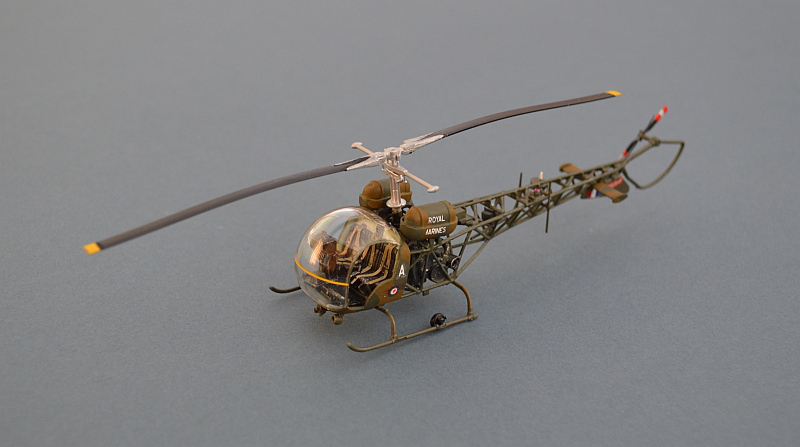 In 1965, Westlands gained a licence from Agusta helicopters in Italy (Bell’s european licence holder) to build the Sioux for the British Armed Forces.. The Royal Marines operated 14 Sioux on loan from the Army, with ground support provided by attached Commando trained REME personnel, and served initially with Commando Air Troops in the far east, seeing action during the so-called Indonesian Confrontation and based out of Sembawang Air Base in Singapore. After returning to the UK in 1971 the Air Troops were combined into 3 Cdo Brigade Air Squadron, flying out of RM Coypool in Plymouth, until they were supplemented by and eventually replaced by Westland Scout AH.1s in 1974. 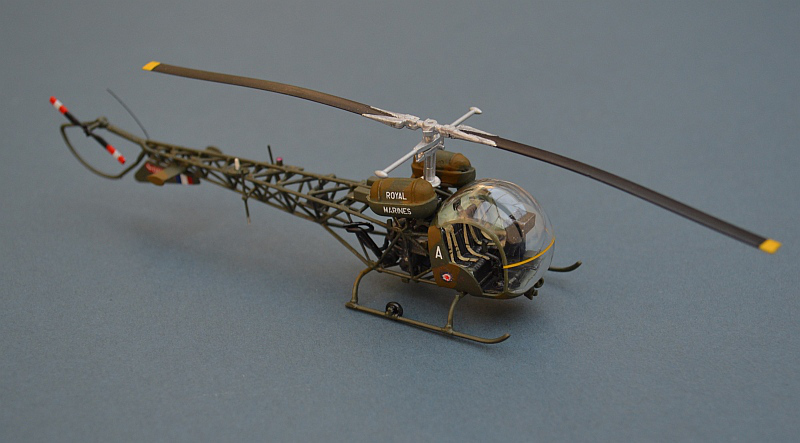 Have a look at my Helicopter pages for more RM aviation and many others. 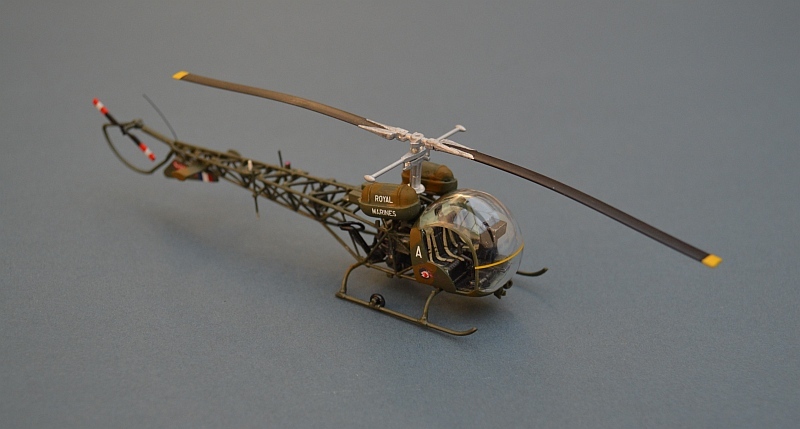 Italeri have managed a fair representation of the Sioux’s delicate airframe structure and although probably a little over scale, the tubular tail boom is sufficiently realistic for most modellers. Its not the easiest build, due to its delicate and complex construction, but fit is generally good and it should offer the patient modeller few problems. I had some issues with the fit of the engine, finding that mine eventually fouled the airframe. One fuel tank was missing, so I cloned a replacement from the remaining one using putty. I don’t think I got it wrong, so perhaps this is a problem with the kit. The aircraft sits on its skids without the need for any weight to be added. Cabin side doors are provided, but seldom fitted on RM machines in the far east. 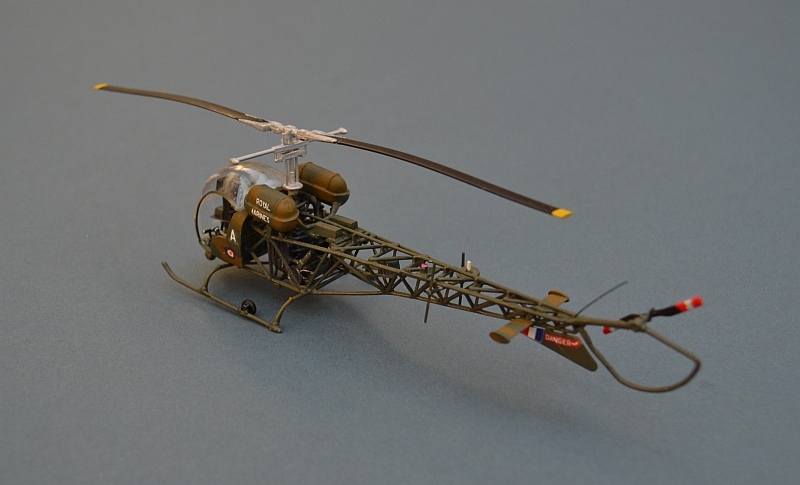 My kit issue was a US Army variant, so to create a UK machine, I added a slightly different aerial fit and provided transfers from the spares box.